Health care reform (HCR) in Massachusetts was expected to expand insurance coverage and improve outcomes, but the effect of HCR on patients with traumatic injuries had not been studied. 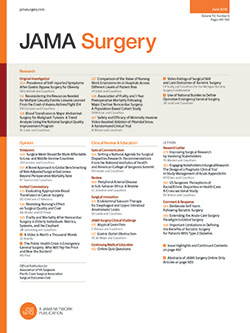 In a retrospective cohort study of patients hospitalized following traumatic injury in Massachusetts or New York during the 10 years (2002-2011) surrounding Massachusetts HCR, Osler et al assessed the effect of HCR on mortality rates using data from the State Inpatient Databases and a difference-in-differences approach to control for temporal trends in mortality. Surprisingly, HCR did not affect health insurance coverage for patients hospitalized following injury but was associated with a transient increase in adjusted mortality rates. Simply promoting health insurance coverage through legislation does not improve survival after injury. Endovascular technology has become ubiquitous in the modern care of abdominal aortic aneurysm (AAA), yet broad estimates of its efficacy among variable hospital and regional settings are not known. Using the American College of Surgeons National Surgical Quality Improvement Program database, Hicks et al perform preliminary analysis of hospital effects on mortality following open AAA repair (OAR) and endovascular AAA repair (EVAR). Weight-adjusted 30-day observed to expected mortality ratios were compared based on hospital type (academic vs community) and size (100-299 beds vs 300-500 beds vs >500 beds). They demonstrate that outcomes for both OAR and EVAR appear to depend greatly on hospital-level effects, suggesting that the relative safety of these procedures may depend on appropriate patient selection and adequate access to multidisciplinary care. From February 21, 2006, through September 24, 2013, the Centers for Medicare & Medicaid Services required that bariatric surgery be performed only in hospitals that had been designated as a Center of Excellence (COE). The effect of this certification requirement on access to bariatric surgery has been reported only anecdotally. Bae et al investigate whether the COE certification requirement proved to be a barrier to patients’ access to bariatric surgical procedures. Using the National Inpatient Sample, they retrospectively identified patients who underwent bariatric surgery from January 1, 2006, through December 31, 2011. Logistic regression and χ2 tests were used to examine differences in patients’ sociodemographic characteristics over time. The result suggests that the COE certification requirement did not limit patients’ access to bariatric surgery based on demographic characteristics. The use of perioperative pharmacologic β-blockade in patients at low risk of myocardial ischemic events undergoing noncardiac surgery (NCS) is controversial because of the risk of stroke and hypotension. Using a 4-point cardiac risk score, Friedell et al performed a retrospective observational analysis of 326 489 patients undergoing surgery in Veterans Affairs hospitals. In this large series, β-blockade appears to be beneficial perioperatively in patients with high cardiac risk undergoing NCS. However, the use of β-blockers in patients with no cardiac risk factors undergoing NCS increased risk of death in this patient cohort.